A review and analysis of the developed hydraulic system for quenching dynamic oscillations has been carried out. A mathematical model for determining the operation delay time of the hydraulic system of the dynamic quenching of oscillations has been created. A period’s calculation of cleavage of the soil and the operation delay time of quencher dynamic oscillations from which it is possible in theory to establish the ability of the hydraulic system of dynamic quenching of oscillations to operate in due time is performed. A hydraulic system of dynamic quenching of oscillations that occur inside the working unit to prevent the transmission of vibrations to the base of the machine is developed. The analysis of the damper’s means and the method of dynamic damping was conducted, based on which hydraulic system for dynamic quenching of oscillations has been developed. A mathematical sequence for determination of the operation delay time of the quencher was created. The parameters allow us to construct experimental model of hydraulic system for dynamic quenching of oscillations. The basic idea is the presence of feedback from the hydraulic system in the form of reed switch, which allows us in due time to turn on a pump and supply additional portion of hydraulic fluid for more efficient operation of the quencher. A hydraulic damping system which allows full vibroisolation is developed. At the expense of that, the average speed of operation is between 10-20 % of the period of soil cleavage. Будько В. С., Динаміка та регулювання гідро-пневмосистем. Конспект лекцій. Ч.1 К.: НАУ, 2003. – 64 с.
 Cândea I., Popescu S., 2003. Theoretical and experimental study on soil vibrators used for the germinal layer preparation. Motrol: motoryzacja i energetyka rolnictwa, OL PAN, vol. 3. (6), 55-62. Челомей В. Н. Вибрации в технике: Справочник: В 6 т. / Ред. Совет: (пред.). – М.: Машиностроение, 1981. – Т. 6. – 456 с.
 Емцев Б. Т.Техническая гидромеханика. М.: Машиностроение, 1987. – 440 с.
 Гавриленко Б. А., Минин В. А., Рождественский С. Н. Гидравлический привод. – М., Машиностроение, 1968. – 502 с.
 Гийом М. Исследование и расчет гидравлических систем. – М.: Машиностроение, 1964. – 387с. Коробочкин, Б. Л. Динамика гидравлических систем станков. Изд-во: М.: Машиностроение, 1976. – 240 с.
 Lewis E., Sterh H., 1966. Hydraulic control system. M.: Mashinostroenie, 407. В. С. Нагорный Устройства автоматическигидро- и пневмосистем: учебное пособие / В. С. Нагорный, А. А. Денисов. – Москва : Высш. шк., 1991. – 365 с.
 Патент України№ 90197 від 12.05.2014. Попов Д. Н. Динамика и регулирование гидро- и пневмосистем: учебник для вузов. – 2-е изд., перераб. и доп. – М.: Машиностроение, 1987. – 464 с.
 Shorin V., 1980. Elimination of fluctuations in air pipes. M.: Mashinostroenie, 156. Ветров Ю. А. Власов В. В. Машини для земляних робіт. Приклади розрахунку : Навч. посібник. – К.:ІСДО, 1995. –304 с.
 Vilde А., Cesnieks S., Rucins A., 2004. Minimisation of Soil Tillage. Motrol: motoryzacja i energetyka rolnictwa, OL PAN, vol. 4. (30), 237-243. Vilde А., Rucins A., 2004. 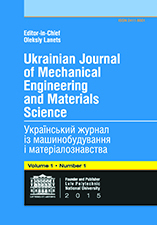 The Impact of Soil Physical and Mechanical Properties on Draft Resistance of Ploughs. Motrol: motoryzacja i energetyka rolnictwa., OL PAN, vol. 4. (31), 243-249. Vilde А., Tanaś W., 2005. Determination of the soilfriction coefficient and specific adhesion. Motrol: motoryzacja i energetyka rolnictwa., OL PAN, vol. 5. (24), 212-217. Walusiak S., Dziubiński M., Pietrzyk W., 2005. An analysis of hydraulic braking system reliability. Motrol: motoryzacja i energetyka rolnictwa., OL PAN, vol. 5. (25), 217-226. Захарчук Б. З. Бульдозеры и рыхлители. М. Машиностроение. 1987.г. 240 с.
 Zipkіn Ya., 1977. Foundations of the theory of automatic systems. M.: Mashinostroenie, 560. Determining the frequency characteristics of the elastic element dynamic quencher fluctuations.